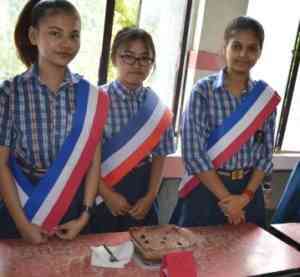 National day of France” 14 July” “Bastille Day” was celebrated in school on 13 th July 2018 in the French Hall. Class IX students converted the French Hall intocountry “ France” by decorating it with modals of French heritage like Monuments, rivers, L’are de Triumph etc. French Hall reflected the French cities. The whole atmosphere turned festive as students celebrated the French festivals. Placards & charts were prepared by the students of classes VI,VII,VIII,depicting French culture. Students of Class IX tickled the taste buds and appetite of the visitors by preparing French cuisine and desserts. The Aroma of Le gateau au chocolat ( chocolate cake), les couscous (A French dish), Les cr’epes (Pan cakes) and baguette (French bread) pervaded the atmosphere. Students and the faculty.members were delighted by the novelty of the French Day.